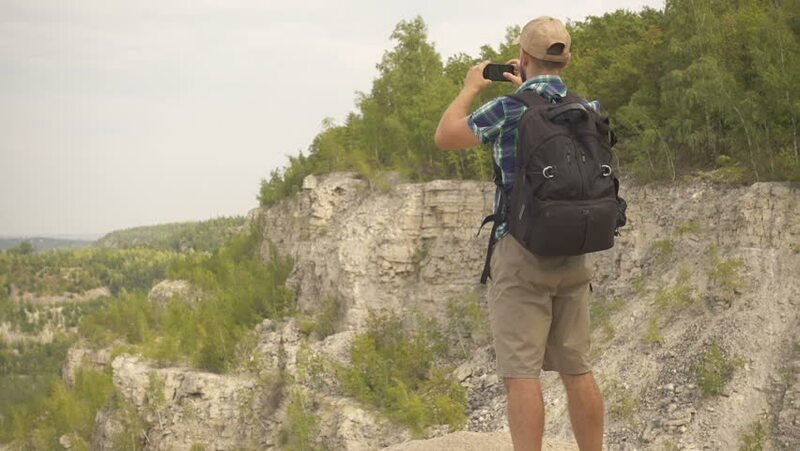 Tourist man with smartphone in mountain . men with backpack in the woods. hiking. a tour of the forest. camping. leisure. ecotourism. wild. adventure begins. . Hiker young man with backpack . hd00:38Tourist man with smartphone in mountain . men with backpack in the woods. hiking. a tour of the forest. camping. leisure. ecotourism. wild. adventure begins.Slow Motion. hd00:08A man hikes with a backpack along a rock cliff to a boulder. hd00:08A male hiker stands at the edge of a boulder cliff with an epic landscape view of a forest in slow motion. hd00:05Photographer who is wearing a hat and hooded shirt taking photos in nature.